There are always going to be some cultural differences when you live in a country other than your own. One of the things that I have now grown used to, but still don't care for, is what I can group under the term "impatience," but it manifests itself in several ways. You didn't push it properly! When waiting at a crosswalk or elevator, the need to push the button repeatedly cannot be resisted. This always makes me think of Ellen Degeneres' stand up routine, when she describes waiting for an elevator. When you walk up to an elevator where people are waiting and see that the button is already lit up, you still push the button again because, obviously, they didn't do it properly. Then, when the person after you comes to wait, and they also push the button, you think "idiot, can't you see that I've already pushed it." haha. When eager bikers area waiting on their green bike light to turn, you can almost see the anxiousness in their fidgety bodies. They repeatedly check to make sure their peddles and feet are in the proper position to not waste any time when the light turns green. If it does not turn in the amount of time they think is 'normal' they press it again, or simply look at the button or the light with confusion or anger, as if it must be broken, or just lazy and by their gaze they will wake it up and it will say, "oh yeah, sorry... here you go... green." Maybe you didn't hear me: Ding Ding Ding! When biking in Holland, you quickly become aware that people are not afraid to use their bike bells. The bells can have many meanings. One ding from behind could mean "look out good sir, I am coming up behind you on your left," whereas two or more dings means "get the h^** out of my way!" The impatience also becomes prevalent when people are squished around a tiny are waiting for a crosswalk sign to turn green. As more people come to the stop, they try to squeeze their bike tire in to any little open spot, even if that means almost leaning entirely against you (which they also sometimes do). 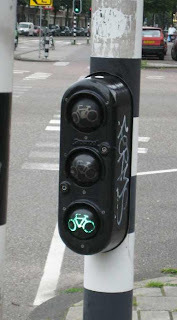 When the light turns green, the real go-getters peddle like mad men to show the rest how proficient and "snell" they are. You know the light is turning green next, just GO! I am extremely happy, almost every day, that I do not own a car, or need to drive in Holland. This would surely bring out the worst in me. People will not only cut other cars off like the best of New York City's elite, but they will literally drive up on a curb to go around someone they think isn't jumping the gun on the green light. In more normal situation, if you don't hit the gas immediately upon the light changing to green, you will be greeted with a barrage of horns and arm waving. The Dutch are also notoriously bad parallel parkers. Perhaps they don't know how to properly park, or perhaps they just think it's a waist of time to make sure their car is lined up so that it does not stick out into traffic or (infamously) halfway up on the sidewalk. You don't mind if I reach over you, do you? In the shops, there is also a different etiquette that you quickly become aware of. If you are in a clothing store looking at a rack of clothes, it is not uncommon for someone to come stand so close to you that they are pushing you with their shoulder, and flipping through the clothes right next to your hand. You might even occasionally have someone reach right over the piece of clothing you are looking at, to look at something on the other side of you. Also, this does not really fall into the category of impatience, but while on the subject of shopping, I can note one other distinct difference. Don't ever expect a sales person to come up to you in the store to ask if you need help. Quite the opposite. They will even appear to be dodging you or running away from you if they see you walking over to ask a question. They very much have the "is my shift over yet" mentality. Yes, admittedly we can go a bit overboard in the US, but 'Customer Service' is very different in Holland. As I mentioned above, it is only natural that things will be different from country to country, and I don't want the above to sound like a list of complaints (though unfortunately it sometimes does sound this way). Rather, it is just a set of observations that I've made over the past couple of years. A lot of the time, I can look at these behaviors as endearing, though every now and then (more often than I wish) it does get on my nerves. You get used to these differences after such a short time, that it's easy to forget that people aren't like this everywhere. I figured that it also won't be very long after we move back to the US that we forget some of these subtle differences. So, thought I'd write them down while they are still fresh in my mind.